Anna Karenina Blu-ray Detailed. Keira Knightley, Jude Law and Aaron Johnson star in Leo Tolstoy’s classic romantic drama, directed by Joe Wright (Pride & Prejudice, Atonement). 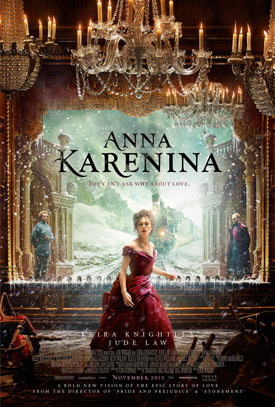 See the special features and movie trailer for Anna Karenina below. Adapted from Leo Tolstoy’s timeless novel. Set in late-19th-century Russia high-society, aristocrat Anna Karenina (Knightley), wed to a stuffy bureaucrat Karenin (Law), enters into a life-changing affair with dashing cavalry officer Vronsky (Johnson). MPAA Rating: (R) for some sexuality and violence. The time is 1874. Vibrant and beautiful, Anna Karenina (Keira Knightley) has what any of her contemporaries would aspire to; she is the wife of Karenin (Jude Law), a high-ranking government official to whom she has borne a son, and her social standing in St. Petersburg could scarcely be higher. She journeys to Moscow after a letter from her philandering brother Oblonsky (Matthew Macfadyen) arrives, asking for Anna to come and help save his marriage to Dolly (Kelly Macdonald). En route, Anna makes the acquaintance of Countess Vronsky (Olivia Williams), who is then met at the train station by her son, the dashing cavalry officer Vronsky (Aaron Taylor-Johnson). When Anna is introduced to Vronsky, there is a mutual spark of instant attraction that cannot – and will not – be ignored.